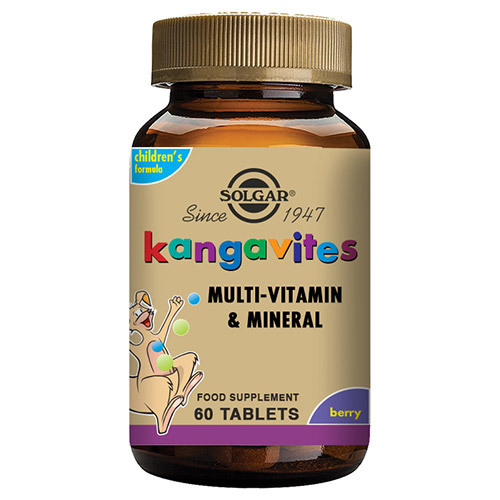 Solgar® Kangavites® is a chewable multivitamin and mineral formula, suitable for children aged 3 upwards. 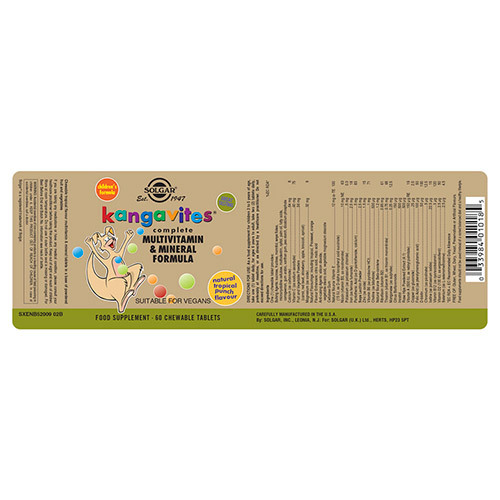 Each Kangavites® product has been carefully formulated, based on nutritional expertise and science, to support the healthy lifestyle habits of children. 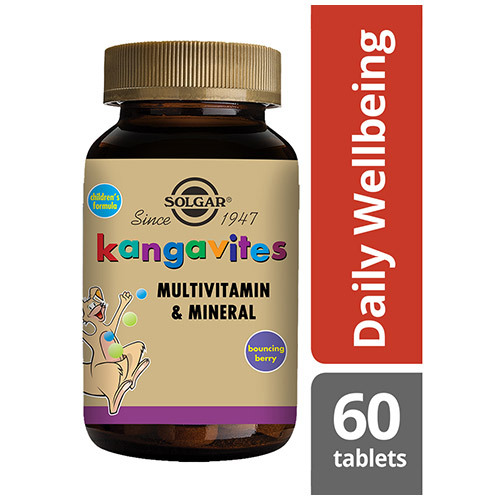 With 28 active ingredients including nutrients such as calcium, magnesium, iron, iodine and vitamin C, D and B`s, a crafted multivitamin and mineral product like Kangavites®, alongside a healthy and balanced diet, is an excellent tool to give your child that extra help to nourish their growth and development. Bulking Agents: sucrose, fructose, mannitol, microcrystalline cellulose, xylitol, carrageenan, maltodextrin, alginate, xanthan gum. 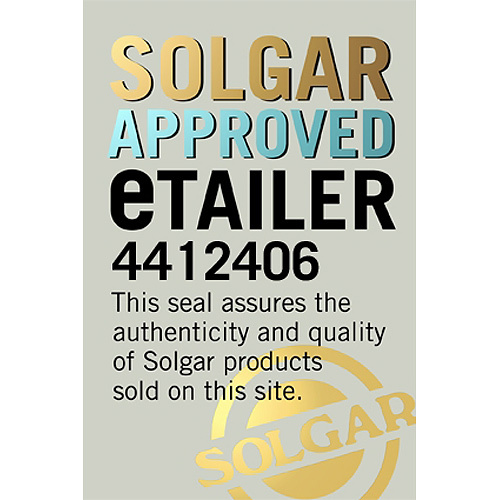 Anti-caking Agents: silicon dioxide, vegetable stearic acid, vegetable magnesium stearate. Natural flavourings: including mixed berry, Prosweet, orange. Flavour enhancers: citric acid, malic acid. Colour: anthocyanins (from grape skins). Children 3-5 years: Take 1 chewable daily. Children 6+ years: Take 2 chewables daily. Preferably at mealtime. Do not exceed directions for use. 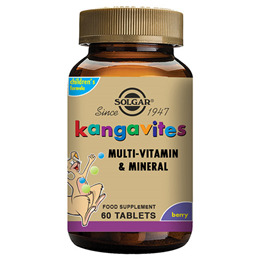 Below are reviews of Solgar Kangavites Vitamins - For Children - Berry - 60 Chewables by bodykind customers. If you have tried this product we'd love to hear what you think so please leave a review. 3 yr old loves them! I have son who is 3 now, his very fussy eater and he has been very ill for very long time/one very bad fewer/virus after another. worrying a lot that he has not much vitamins/minerals to support grown and develop i research a lot trying to find best vitamins for him. honest I'm giving him this vitamins with sambucol kids and I'm very pleased. he is in nursery since january and for the first time he haven't been very ill, just occasional runny nose. the tablets also taste nice so he's very happy eating them.